TwinSpires Blog: Is Pace Overrated? Ed concluded by asking me for my thoughts, which, I must admit, were somewhat mixed… at least at first. While I definitely saw the merit in what he was saying — I’ve continually stressed that pace figures (even my own, which I love more than Joanie loves Chachi) are inferior to speed figures as predictive tools — I still fervently believed that the early fractions of a race can greatly influence its final time. 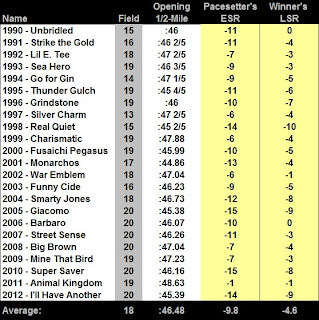 Hence, I have always looked for Kentucky Derby contenders that appeared capable of comfortably coping with the -10 early speed ration (ESR) they were likely to encounter in Louisville (since 1990, the Derby pacesetter has averaged a -9.8 ESR). Of course, I was right about the scenario that I’ll Have Another would face on the first Saturday in May of 2012 — not only was the son of Flower Alley seventh, back eight lengths, at the first call in the Derby that day, but he recorded a -6 ESR to boot. However, I was wrong about the ultimate impact of that scenario. As it turned out, I’ll Have Another had no trouble rallying from off the pace to capture the 138th running of America’s most famous horse race. And that got me to thinking: Was Ed right? Is pace overrated when it comes to deciding who can and who cannot win the Kentucky Derby? 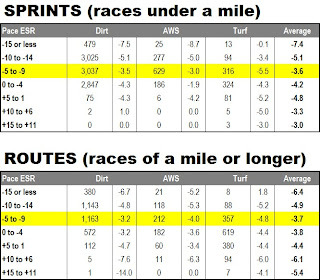 1) I recorded the Brisnet speed figure (BSF) of random race winners and noted the general distance (route/sprint) and surface (dirt/turf/synthetic) at/over which those numbers were earned. 2) I subtracted the associated race pars from the speed figures obtained above, which allowed me to compare races from across the class spectrum. For example, if a particular race featured a par of 103 and the winner earned a 97 BSF, I would record its final speed rating as a -6 (97 – 103 = -6). 3) Lastly, I determined the average adjusted speed rating for a given range of ESRs earned by the first-call leader(s) of the races in question. 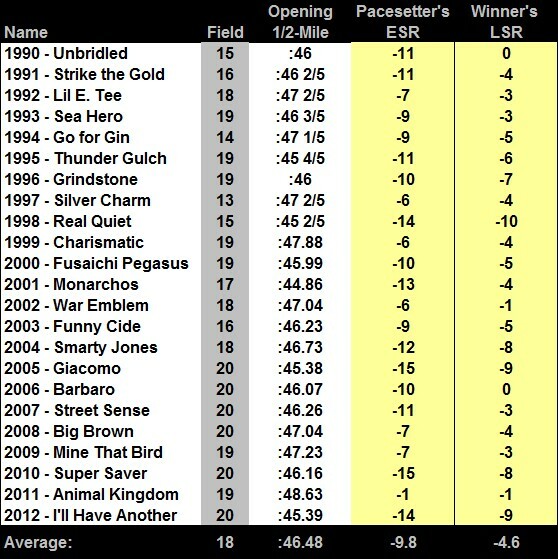 As you can see, the ideal pace in terms of producing the best, or fastest, speed rating on dirt is a moderate to brisk one (-5 to -9 ESR). This is true in both sprints and routes (ignoring samples of fewer than 10 horses). On synthetic and turf surfaces, the best Brisnet speed figures in relation to par come in races featuring soft to moderate ESRs. However, the real stunner — at least to me — is that slower relative paces (higher ESRs) don’t appear to alter the winner’s speed figure that much and fast paces (lower ESRs), which many, myself included, have always assumed acted as springboards to higher figs, in fact, did just the opposite — stifling the final speed rating across all categories, save turf sprints. Ironically, this passage was subsequently removed from later editions of Beyer’s seminal work, as the author claimed to have seen the light — due primarily to the 1981 Kentucky Derby. "If I wanted to test the influence of pace, I might have designed an experiment like this: Have the early leaders in the Kentucky Derby run the fastest first quarter-mile in the history of the race and judge its effect,” Beyer wrote in The Winning Horseplayer, which was first published in 1994.
" … The Derby field was filled with brilliant speed horses, notably Proud Appeal and Cure the Blues. They all went charging for the lead, and a bullet named Top Avenger got it, running the quarter in 21-4/5 seconds — the fastest fraction at Churchill Downs in 107 years — and the half-mile in a swift :45-1/5. Every horse who was near this breathtaking pace collapsed. The horses who were running 1-2-3-4-5 after three-quarters of a mile finished 19-10-18-16-17. As they backed up, all the stretch runners and plodders passed them. The first five finishers at the end of the Derby were horses who had been running 15-19-10-17-20 after three-quarters. "The winner, Pleasant Colony, was a genuinely good horse, but nondescript plodders like Woodchopper and Television Studio had rallied to finish ahead of superior horses like Cure the Blues and Proud Appeal by margins of 20 or 30 lengths,” Beyer pointed out. “The outcome of the Derby seemed to have relatively little to do with the ability of the horses; it was much more the result of pace." Notice, however (and I think this is a key point), that Beyer’s “epiphany” does not actually relate to the final running time of the race (Ed’s point); it only pertains to individual contenders. And guess what? That blistering :45-1/5 opening half-mile in 1981 led to a very commonplace 2:02 final clocking — tied with six other editions as the 27th fastest Derby ever… hardly the stuff of legends. Ed DeRosa 1, pace handicappers 0. This whole piece is a non sequitor: Ed's premise that "fast horses go fast" is disputed by your example of the '81 derby, where the "fast" horses did not run a final fast time. Ed has a basic lack of understanding of equine [and human] physiology. Slow paces absolutely compromise final times, once a second is lost it cannot be made up. Disbelieve me? Head to your local track and test it on yourself. Love your stuff Derek, but in this case i'll chalk it up to a bad day at the office ! I'm confident you will bounce back strong with your next piece. Ron: We all acknowledge that a horse can't run the Derby in 2 minutes if the mile went in 1:41. My comment had more to do with not always blaming a slow final time (or final figure) on pace. Maybe the horses in question just aren't that fast. In order to run a 1:36 mile you have to get six furlongs in 1:14 (which would be a VERY slow pace for a mile). So, yeah, it's possible that the final time is slow because of "pace" or maybe the horse is just slow? They will run six furlongs in 1:12 this year. A horse who can close the final half in :48 off that kind of pace will win the Derby. It's unlikely but possible. If the final time is 2:01, though, can a horse who was ten lengths off the pace going into the far turn win? He'd have to do it in :47. That's an extremely tall order. Fast horses go fast. Going six furlongs in 1:15 isn't being a victim of pace. It's being slow. 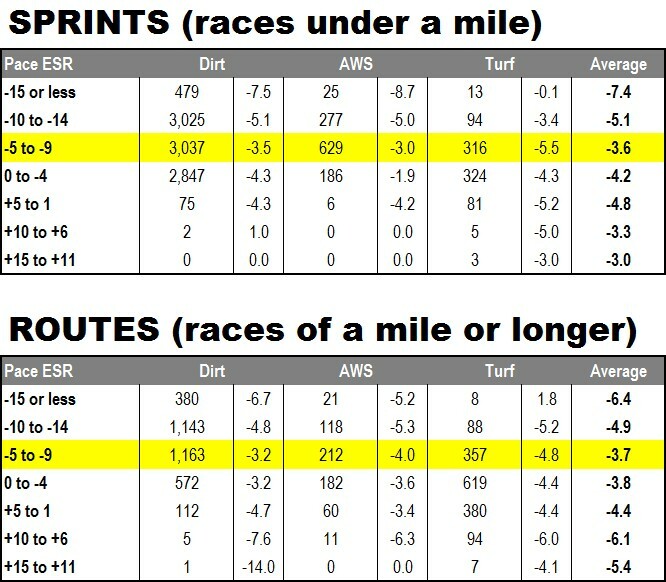 Have you thought of doing a similar analysis with Beyer speed figures? You might find it instructional. Well, at least, I would like to observe the results. I think horses have a comfort zone that will result in their best effort. When a route race is run in an extreme fashion, jocks on closers tend to move from that comfort zone; either because they are afraid of a runaway sprinter getting away, or a slow pace compromising their chances to outsprint the pace in the stretch. The result is that no one runs their optimal race and the final times and speed figures reflect this. Sometimes, I get the feeling that many handicapping theories come from the idiosyncrosies of the figures themselves. "Looking a pace the wrong way as most do...Final time has to be built on the interaction of all those that really create it and the passive ones (the deep movers) react to." This is a given, but it doesn't change the fact that the Derby tends to require a fairly specific type of interaction... and it's not the ability to close off of a :50 half. Ed can talk for himself -- as anyone who's listened to the podcast knows (LOL) -- but I believe his point relates to giving EXTRA CREDIT to horses that ran slow in slow-paced races. I KNOW he doesn't believe that a slow pace is immaterial to the final time. Still, my studies show that pace (again, within reason) is not as influential to the final time as one might think. "I think horses have a comfort zone that will result in their best effort. When a route race is run in an extreme fashion, jocks on closers tend to move from that comfort zone; either because they are afraid of a runaway sprinter getting away, or a slow pace compromising their chances to outsprint the pace in the stretch. The result is that no one runs their optimal race and the final times and speed figures reflect this." Completely agree with this. On a micro level, there is no question that pace influences WHO wins. The main thing I tried to address here is the effect of pace in terms of HOW a race is won. In my opinion, it's because of this negligible effect of pace on time, that Andy Beyer initially dismissed pace as a factor altogether.